Above: Judd Holdren in the serial Zombies of the Stratosphere (Republic, 1952). Dark, handsome, lean, athletic, and square-jawed, Judd Holdren was an ideal serial star from a purely visual standpoint; among chapterplay leads, only Kane Richmond looked as much like a comic-book hero come to life. However, Holdren’s screen personality didn’t measure up to his looks; he ranks as one of the serial genre’s blandest multiple-serial heroes. Sternly serious in demeanor, he was rarely able to convey the dashing cheerfulness that made the aforementioned Richmond so charismatic; he was on firmer ground when it came to projecting sternness and decisive authoritativeness–but was also somewhat hampered in this area, by a pronounced Midwestern accent which blunted and softened the effect of his solid speaking voice, and kept him from ever sounding quite as commanding as he should have. That said, Holdren did possess two unqualified acting assets–earnestness and energy; he always snapped out his lines with grave and confident enthusiasm, and never seemed embarrassed by the science-fictional gimmickry that pervaded all of his serial vehicles. Judd Holdren was born and raised on a farm in Taylor County, Iowa. He became interested in acting during his school years, and, (sometime between 1935 and 1940), moved from his home state to Omaha, Nebraska–where he studied accounting, and (by 1940) landed a bookkeeping job with a brokerage firm; he also studied acting in Nebraska, at the Omaha Playhouse. However, World War 2 interrupted both his accounting and theatrical careers; he spent the duration serving on a Coast Guard vessel stationed in Hawaii. After finishing this hitch in the Pacific, he landed in California, where he modeled for magazine ads, did some stage and nightclub performing, and–circa 1949–began appearing in the movies. Over the next two years, he played multiple bit parts, a few villainous roles (in a couple of Universal B-western shorts), and one prominent co-starring part (in the Columbia musical/drama Purple Heart Diary) before taking his first top-billed role in the serial Captain Video (Columbia, 1951). 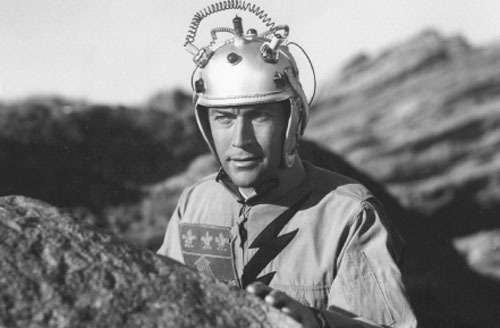 Based on a popular early television show, Captain Video starred Holdren as the title character, the leader of a far-flung army of scientific crime-fighting “Rangers;” aided by this support network, Video tirelessly battled the extraterrestrial menace Vultura (Gene Roth), the dictator of the planet Atoma and the would-be ruler of the entire galaxy. 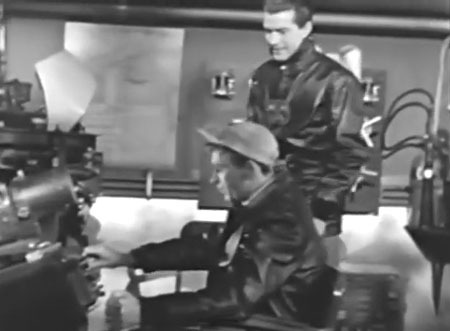 Video’s ambitious and large-scale plot was more or less torpedoed by the serial’s weak special effects and–especially–by a comical overreliance on gadgetry; the hero and his chief Ranger (Larry Stewart) repeatedly used unlikely and unconvincing scientific devices to escape peril, spouting plenty of convoluted technobabble in the process. Holdren did an admirably straight-faced job with this awkward pseudo-technical dialogue, delivering it in keenly alert and grimly self-assured style; he also recited some heavy-handed anti-totalitarian speeches with sober conviction, and even leavened his resolutely military bearing with occasional displays of wry cheerfulness. On the whole, Holdren delivered his strongest serial performance in Video, despite the production’s overall absurdity. Above: Judd Holdren questions treacherous scientist George Eldredge in Captain Video (Columbia, 1951). 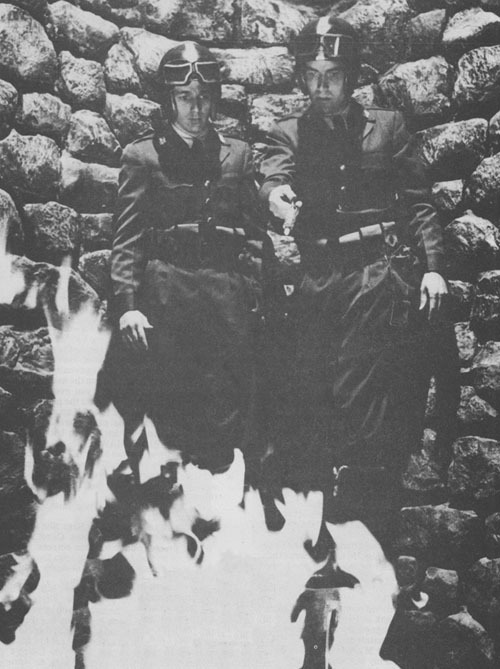 Above: Larry Stewart and Judd Holdren are trapped by flames on the planet Atoma in Captain Video. 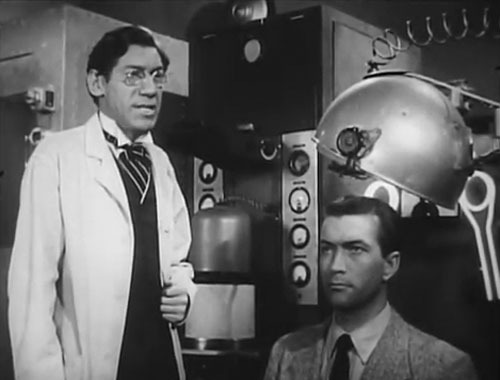 After playing supporting roles in the Monogram B-film Gold Fever and the Walter Wanger production Lady in the Iron Mask (both 1952), Holdren took another starring part in another science-fiction serial, Zombies of the Stratosphere (Republic, 1952). 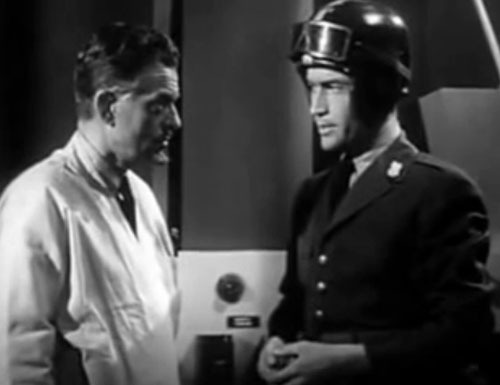 A creative and slickly-produced combination of old and new footage, this chapterplay cast Holdren as a government scientist/investigator named Larry Martin, who used his rocketship and his flying rocket-suit to combat a small band of Martians who were plotting to knock Earth out of its orbit with a hydrogen bomb. A more successful sci-fi adventure than Captain Video (thanks to streamlined scripting and excellent effects work), Zombies was easily the best of Holdren’s serials–although it gave him less dialogue than his debut chapterplay had. He spent most of his screen time hurrying from one new or recycled action scene to the other, occasionally pausing to issue orders or rattle off expository lines with typical urgency and seriousness. Above: Judd Holdren, just landed from a rocket-suit flight, checks in with rocketship pilot Gayle Kellogg in Zombies of the Stratosphere (Republic, 1952). 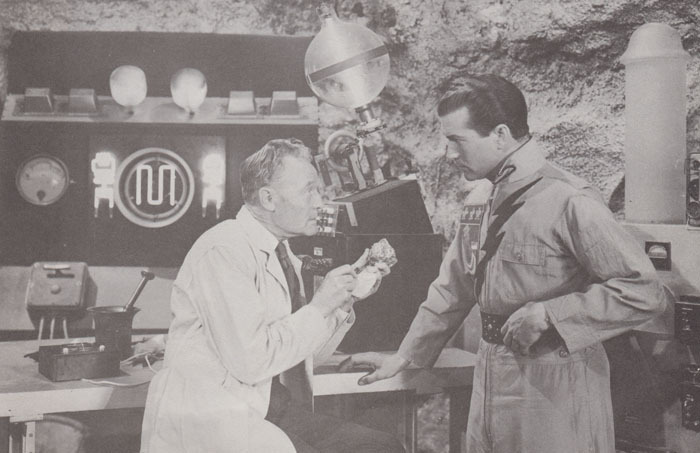 Above: Judd Holdren tries to get a clear shot at a Martian robot in Zombies of the Stratosphere (Republic, 1952); that’s Wilson Wood in the grip of the metal monster, and Aline Towne watching in alarm. 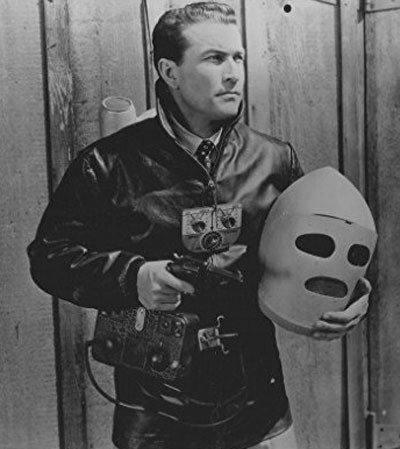 Zombies of the Stratosphere had originally been written as a sequel to Republic’s earlier serial Radar Men from the Moon, but was altered when Republic decided to revamp Radar Men’s lead character “Commando Cody” for a TV series. Holdren, who’d missed the chance to play Cody in Zombies, was given the role in this show; filmed in 1952 and 1953, it only numbered twelve episodes in all, and was released to theaters as a pseudo-serial before finally airing on television in 1955. Holdren did additional television work in those years, making several appearaces on The Lone Ranger and The Range Rider; he also appeared in one more full-fledged serial in 1953, Columbia’s The Lost Planet. Lost Planet starred Holdren as a reporter named Rex Barrow, who discovered that a mad scientist named Dr. Grood (Michael Fox) was mining a powerful mineral called Cosmonium on the planet Ergro–and was planning to use it to conquer the planet Earth. Barrow’s subsequent battle against Grood was aided materially by Professor Dorn (Forrest Taylor), a scientist who was held captive by Grood but who secretly worked against him; in fact, Dorn’s vast scientific knowledge proved much more of an impediment to Grood than Barrow’s activities did. Even more absurdly gadget-heavy than Captain Video, Planet didn’t allow Holdren many opportunities to give orders, make plans, or explain technological gimmicks–and thus kept him from displaying much of the take-charge spirit he’d shown in his other serials. His character was essentially a courageous but hapless pawn in the struggle between Grood and Dorn, and his performance was effectively overshadowed by the scene-stealing turns of the veteran actors who played the two dueling scientists. 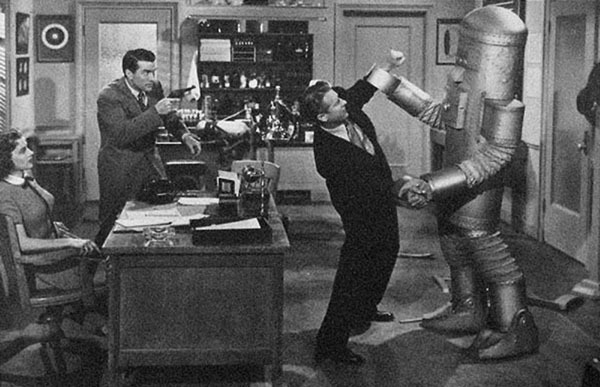 Above: Judd Holdren is mechanically brainwashed by Michael Fox in The Lost Planet (Columbia, 1953). Above: Forrest Taylor explains some of the properties of Cosmonium to Judd Holdren in The Lost Planet. Holdren continued his acting career throughout the 1950s, but won no more starring parts; he played a recurring role on the Rocky Jones, Space Ranger series, guested on many other TV shows, did stage work with the Pasadena Playhouse, and made sporadic feature-film appearances until 1960, when he abandoned the acting profession altogether. Holdren returned to bookkeeping for a time, working for the actors’ agency Cunningham and Associates, and later took a job as an insurance salesman; his life came to an unhappy end in 1974, when he shot himself in Los Angeles at the age of fifty-eight. Although he top-lined the casts of more 1950s serials than any other actor, Judd Holdren has never developed much of a fan following among serial buffs–partly because of his own acting limitations, and partly because of the nature of his serial vehicles, all of which were filled with outlandish gimmicks and gadgets that could easily have obscured stronger players than Holdren. Still, he deserves credit for the unflappable solemnity with which he delivered long-winded “scientific” dialogue and reacted to bizarre “scientific” threats; his colorless but determinedly steely performances provided perfectly adequate anchors for the wild sci-fi fantasies he starred in. Above: Judd Holdren in The Lost Planet (Columbia, 1953). Acknowledgements: The 1940 federal census, which also catalogs each citizen’s 1935 residence, helped me to narrow down the date of Holdren’s move from Iowa to Nebraska, and also gave me his 1940 occupation. The short profile on Holdren at the online Des Moines Register’s Famous Iowans page assisted me as well; my main source for this article, however, was Laura Wagner’s article on Holdren (“Judd Holdren: Obsolete Hero”), printed in the Winter 2012/2013 issue of Films of the Golden Age. My special thanks go to Tom Weaver–interviewer, author, and all-round expert on horror films, sci-fi movies, and serials–for providing me with a copy of the Wagner piece.